On July 11, 2014, a Petersburg jury returned a verdict in the amount of $1,880,385 against Cameron J. Butts on account of the death of Ikeyia M. Jones. Ms. Jones died on February 10, 2013, after being ejected from a speeding car that struck the brick wall of Blandford Cemetery while northbound at a curve on South Crater Road in Petersburg. The lawsuit was filed by the Estate of Ms. Jones. We represented the Estate. We worked hard on this case and split the work up evenly between the two of us. I (Richard Cuthbert) delivered the opening statement and Charles Cuthbert delivered the closing argument. The evidence in this case was circumstantial. There was a question as to which of the three occupants of the car was driving at the time of the single car auto accident: The Defendant pled the Fifth Amendment, Ms. Jones died at the scene, and by agreement neither party called the car’s third occupant to testify. 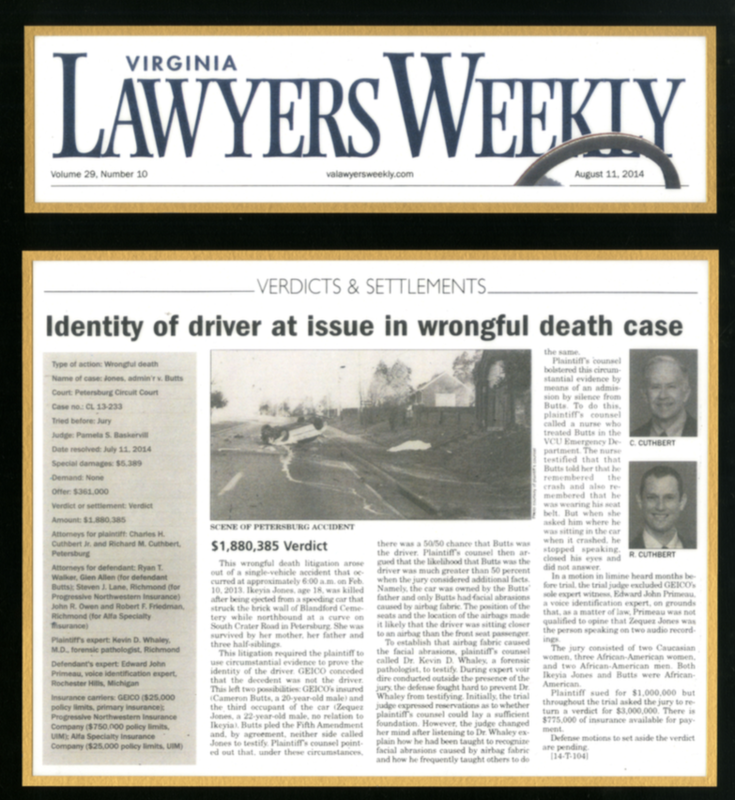 In support of the allegation that Defendant was the driver, the plaintiff used photographs of the Defendant’s face, taken at VCU Medical Center by the Petersburg Police. Those photographs depicted numerous shallow facial abrasions on the Defendant’s face. Thin parallel lines could be seen within the abrasions. Additional photographs demonstrated that neither of the other occupants suffered facial abrasions. We retained an expert witness, Kevin D. Whaley, M. D., a forensic pathologist with the Richmond Office of the Chief Medical Examiner. Based on a review of the police photographs, Dr. Whaley testified that airbag fabric caused Mr. Butts’ facial abrasions, including the thin parallel lines. A police photograph of the interior of the wrecked car showed that the driver was likely sitting closer to an airbag than was the front seat passenger. 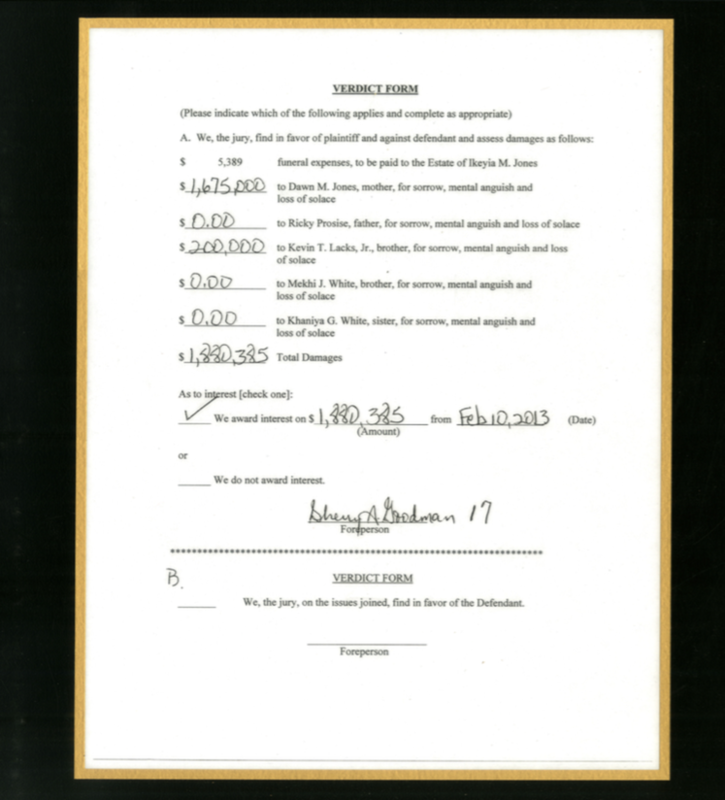 The testimony of a nurse supplied additional proof that the Defendant was the driver. The nurse treated the Defendant in the VCU Medical Center Emergency Department and testified that the Defendant told her that he remembered the crash and remembered that he was wearing his seat belt. But when she asked him where he was sitting in the car when it crashed he stopped speaking, closed his eyes, and did not answer. We asked the jury to treat this silence as an admission by the Defendant that he was the driver.